The MimioBoard ME-77 Interactive Whiteboard is a lightweight and easy to install product that offers a large 77” HD display. The ME-77 is integrated with the MimioTeach Bar that allows easy handling and portability in changing rooms if needed. Furthermore, the ME-77 incorporates an erasable, magnetic ceramic steel surface that is durable and smooth to use. The ME-77 features wireless connections via the MimioHub with other Mimio integrated products. Additionally, collaborative learning is enhanced through the MimioStudio software included in the packages that supports various mini applications to help create lessons. Furthermore, it allows PC connections with the use of USB 2.0 that also allows data transfer at 12Mbps. The ME-77 also comes along with rechargeable stylus that retains charge for up to 10 hours and are easy to hold and use with their ergonomic design. The whiteboard supports a rigid aluminium frame with powered coated finish for durable exterior. This product comes with a 2 year warranty with extended 5 year warranty on the hardware. With easy installation with the wall brackets included, the ME-77 can easily be placed and be make portable with the help of the Mimio integrated products. 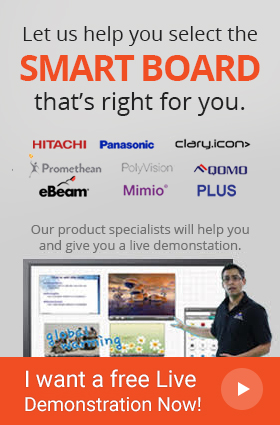 The MimioBoard ME-77 provides a clean, hassle-free whiteboard interface for collaborative and enhanced learning.